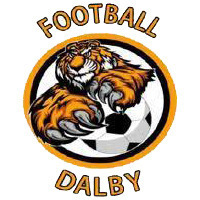 Football Dalby is the home of the Dalby Tigers (Soccer) and is situated at the Dalby PCYC off Cooper Street. Football Dalby comes under the affiliation of Football Federation Australia, Football Queensland and Football Queensland South West. Football Dalby is proud to have 2 Senior teams - Dalby Men & Dalby Ladies. Dalby Ladies are the 2017 Division 1 Runners Up. Both Senior teams play in the Toowoomba Football League Competition with games being played at home, Chinchilla, Toowoomba, Gatton, High Fields, Withcott and surrounds. The season runs from beginning March through to mid September. Football Dalby has approximately 130 Juniors from Under 6 through to Under 16. Juniors must turn 5 before registering. Our juniors combine teams to play against other Dalby teams as well as teams from Football Chinchilla. Generally Juniors play alternative weeks in Dalby and Chinchilla. The season runs over terms 2 and 3 of the school year. There is also opportunities for Juniors to participate in each age group for Representative Football playing carnivals at surrounding areas of South Burnett, Toowoomba, Gatton and the Granite Belt. The club also runs the Kick Off Program (Squirts) for 3 - 5 year olds for approx 8 weeks per season. Please stay in touch for further information on this program. There are several positions vacant which include Canteen Coordinator, Kick Off (Squirts) Coordinator and Fundraising Coordinator. The committee is very supportive of Volunteers and the club can not run without support of our members. Please consider assisting where you can. The 2018 Season is shaping up to be a fantastic year in Football with a brand new committee who are dedicated to improving the growth and opportunities within the club. Please feel free to contact any of the committee if you require any further information. Cheers from the Football Dalby Team!